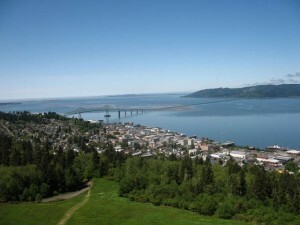 We’ll spend our first day zipping around Astoria, Oregon on the Pacific coast. Astoria, about to celebrate its 200th anniversary, is one of the oldest American cities in the Pacific Northwest. Named after John Jacob Astor, it was originally a fur trading center and transportation hub. More recently, it became the home of canned tuna and the famous Bumble Bee tuna brand. We’ll spend a few hours riding to make sure all our gear works right. Then we’ll dip our rear wheel in the Pacific Ocean and get under way.